The 2013 Caribbean American Networking and Social Media Series will kick off in Atlanta, Georgia on Thursday May 23, 2013. The annual recognition identifies professionals and civic minded individuals of Caribbean heritage, living in the metro Atlanta area, who have contributed to the multicultural community. Our honorees were carefully considered amongst an excellent slate of distinguished nominees, which includes film producers, songwriters, executives, doctors, and community leaders. The accomplishments of our honorees, play a significant role in the continued growth of the metro Atlanta area, and surrounding counties. The Caribbean Media Network, in conjunction with affiliates, will host a memorable networking celebration on Thursday, May 23, 2013, at Fins Restaurant and Lounge, located in Midtown Atlanta. The event will start promptly at 7:00p.m. The event timing has a notable significance for Caribbean Americans in Atlanta, as the city plays host to the 25th Anniversary of Atlanta Caribbean Festival, on May 25, 2013. 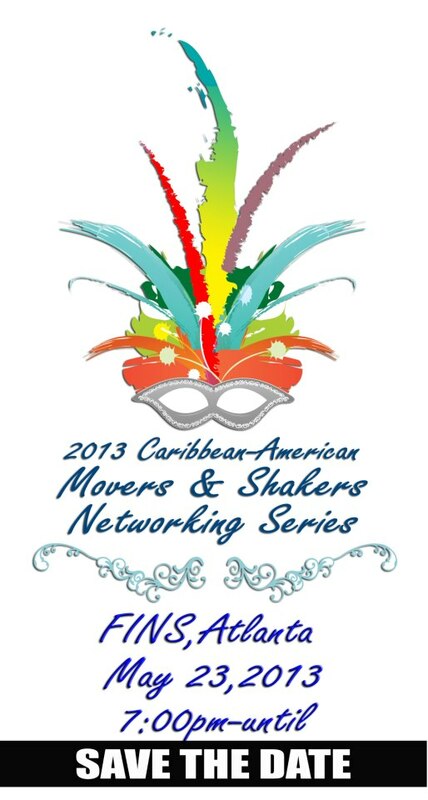 The 2013 Caribbean American Movers and Shakers Networking Series includes a series of promotional events, in the prime markets of Atlanta, Georgia, New York City, and Miami, Florida, throughout the year. The 2013 Atlanta Networking Event, will be hosted by Caribbean American Diva, Red Carpet Shelley, who serves as an ambassador of Caribbean lifestyle and culture. Music will be provided by radio personalities Kahlil Wonda and Super Pec of Highlanda Sound, throughout the evening. For more information on RSVP and celebrity involvement: Please contact Caribbean Media Network at 404-455-2944 or email mthomas@caribemedianetwork.com . A memorable occasion for advocates of #Caribbean culture & progress for the entire diaspora. Save the date & hope to see everyone in attendance to this celebratory event.